These Instant Snow powder produces up to 50x its original size. Instant snow is easy to make and creates amazing artificial snow. 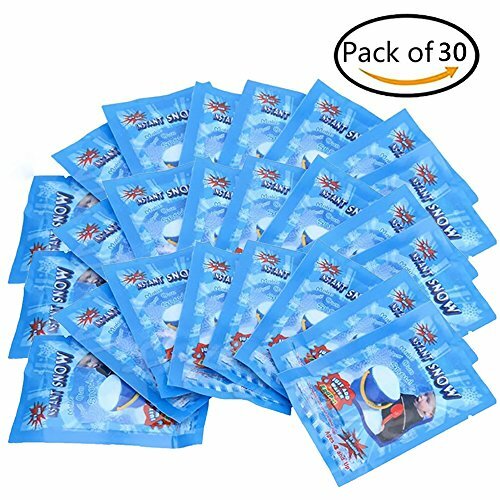 Instant snow powder for slime! How to make a super fluffy cloud slime? 1. First make the borax mixture by adding 1 teaspoon of borax powder to 1 cup of warm water (hot tap water will work). Stir well to combine. Set aside. 2. Add 1 cup of glue into a bowl（No Included）. Add some food coloring if you'd like and stir well. 3. Now add some of the borax mixture into the bowl and stir with a spoon or wooden stick. Keep adding and mixing until it begins to form. 4. This time you can over activate your slime so it becomes stiff. 5. Add lots of Instant-Snow and keep kneading until your slime becomes the consistency that you want. If it becomes too sticky, you can add more slime activator. Powder Water Subscription Ratio: 1:25-30 / g.
Non-toxic, non-agglomeration, non-stick,looks real,high expansion. Apply to: Wedding, showcase, video, stage, christmas, gifts, education tools and decor. Hold time: 10-15 days indoor, 2-3 days outdoor under the sun. Due to the different weather in different countries, they may differ. When the water is gone, you can sprinkle the water on its surface to re-dilate them. If you have any questions about this product by GZQ, contact us by completing and submitting the form below. If you are looking for a specif part number, please include it with your message.